First Line:"There are forty seven rules every Shifter must obey." 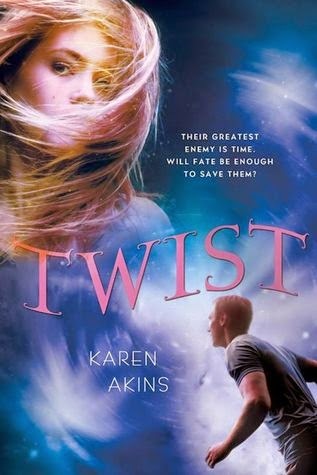 Review: Twist is the second and I believe final book in the Loop series. I have been looking forward to reading Twist ever since I read Loop last year and I really had a blast. I'm glad it's a duology but I would not have been upset if this was trilogy just because I really did grow attatched to the characters. Seriously if you love time travel and sci-fi books check this series out it definitely deserves a lot more attention. The book had even more action then the last, it was just non-stop one thing after the next and I loved it. It was never boring and yes there are several timelines and multiple changes being made to the timelines and different versions of Bree and other characters popping up from the future and the past but as crazy as it all seems just like the first book Akins did a great job in not confusing the reader and it was all very easy to understand and keep up with. Bree thought everything was fine after the craziness from the last book but then someone is making changes to her timeline and screwing things up for her very badly and that includes things with Finn. Then Shifters start getting kidnapped and ICE we find out is even more devious then we first thought and Bree is running around trying to fix it all while slowly losing hope since every step she takes forward in fixing things someone is right there messing it all up and she has to take two steps back. Then there was the ending which I think was perfect, yes in a way it was bittersweet but you know what... I get it and it makes sense. Overall this is one of the better time traveling books I have come across and I highly recommend the duology, both books were fast paced and a complete page turner.